This World Fantasy Award winner in the vein of Animal Farm delves into a lab worthy of a mad Nazi scientist—but run by a brilliantly sadistic rodent. In the annals of American literature, there has never been a character quite like Doctor Rat, PhD. From one of the most indispensable storytellers in speculative fiction, this biting satire introduces a narrator of learned charm and humor, and a twisted logic that is absolutely chilling. Doctor Rat is a credit to his species. A survivor of the most refined scientific experiments, now removed from the maze, he has become a valued and productive member of the academic community. When he must administer a lethal dose, he comforts his fellow rats with his compassionate slogan: "Death is freedom." But everything changes when animals worldwide begin to rebel, refusing to accept their proper places in the natural order of things: as test subjects, pets, or food. And only Doctor Rat has the courage to defend mankind from the ungrateful animal kingdom. 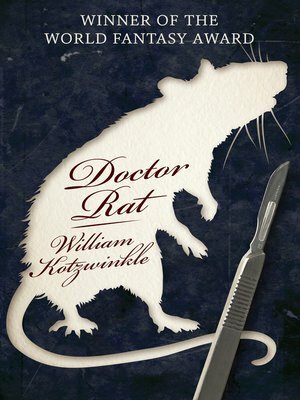 Hailed by the Los Angeles Times as "dazzlingly original" and "occasionally quite beautiful," Doctor Rat is a sly and stylish indictment of fanaticism in mice and men.